Homeowners on 209th Avenue Northeast agree that storm water is not properly draining from their street, leaving a large puddle up to 10 inches high in the way of traffic for parts of the winter. However, when it comes to the cause and solution to the problem, opinions vary. The avenue is in an area that is vulnerable to landslides and erosion hazards because of its hills, city officials said. An increase in real estate development in the past four years has also reduced the number of trees around to soak up water, increasing flooding. Resident Fran Hogan (pictured) has dealt with the problem by installing a $500 pump to carry water out during the rainy season. Published in the Sammamish Review.Read the story. More than 50,000 people in parts of Sammamish, Issaquah and unincorporated King County will soon pay more for water and sewer service. The Sammamish Plateau Water and Sewer District, which is one of two sewer authorities serving the city, has raised its service rates by 9 percent and increased its connection fees for new users. Four percent of the increase is attributed to inflation and 5 percent is for long-term capital reinvestment, according to the district. The rate hike takes effect in the next billing cycle, beginning with Sept. 22 bills. The district bills customers in eight time cycles and each bill covers the two months leading up to the billing date. City planners are proposing a series of changes to development and drainage requirements in Sammamish that they say will reduce bureaucracy and protect the environment. But some environmentalists say those two goals are inconsistent. At a June 19 meeting, the city’s Planning Commission heard recommendations about some of the less controversial proposals to amend portions of the municipal building code. Proposed changes to the critical areas code that came up at another recent meeting have generated more controversy. Sammamish planners want to encourage developers to minimize their impact on the environment by offering them benefits. City planners are proposing a low impact development ordinance that would reward developers of commercial and large residential projects for using a host of storm water methods favored by environmentalists. Low impact development is a storm water management and land development strategy that aims to minimize soil disturbance and impervious surfaces, protect natural features and add vegetation. Sammamish residents may have to pay more for water and sewer service by 2009. The Sammamish Plateau Water and Sewer Authority, which provides sewer and water service to more than 50,000 people in parts of Sammamish, Issaquah and unincorporated King County, is proposing to increase base charges and usage charges by 9 percent. Additionally, the Metropolitan King County Council has voted to increase its portion of the bill. 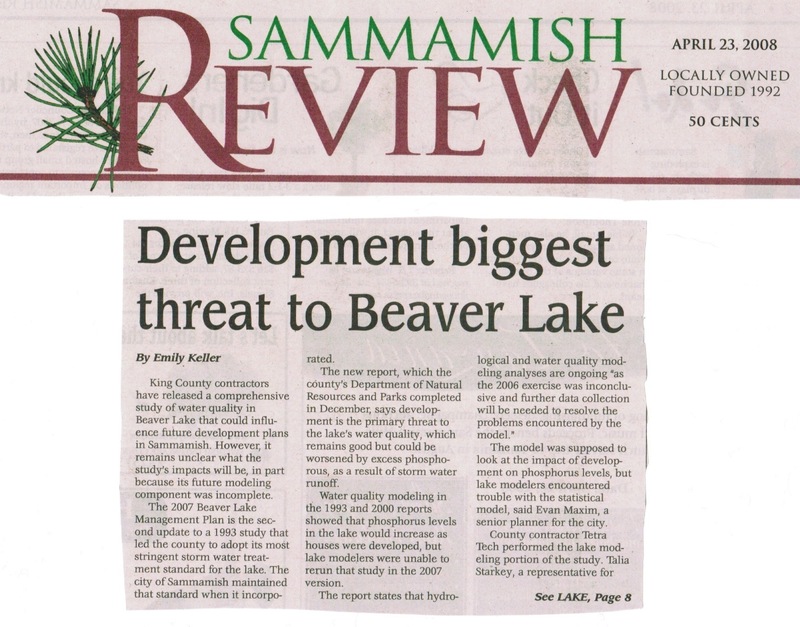 King County contractors have released a comprehensive study of water quality in Beaver Lake that could influence future development plans in Sammamish. However, it remains unclear what the study's impacts will be, in part because its future modeling component was incomplete. The 2007 Beaver Lake Management Plan is the second update to a 1993 study that led the county to adopt its most stringent storm water treatment standard for the lake. 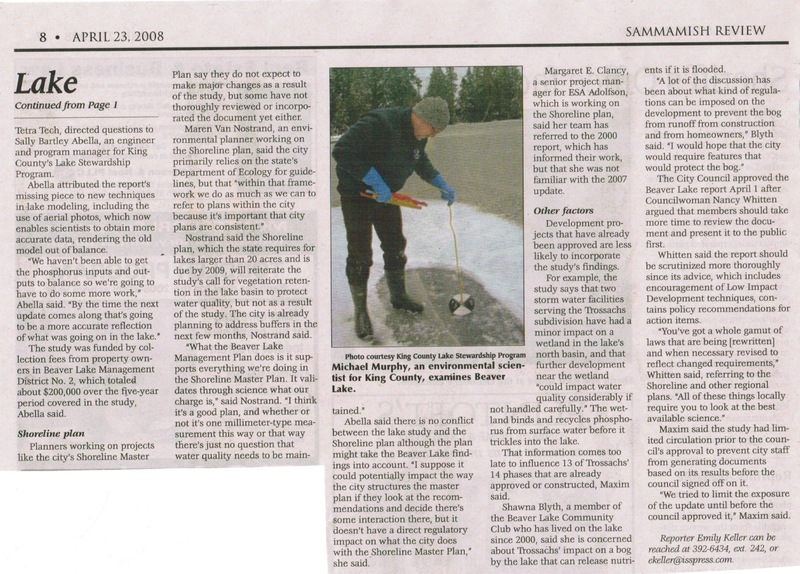 The city of Sammamish maintained that standard when it incorporated. Published in the Sammamish Review. Click here to read page one. Click here to read page two.